Important Facts About Shrimp – Shrimps are healthy foods that are low in calories. This food often presented in a holiday menu. If you like seafood, you will undoubtedly try the food from shrimp. But some people fear the shrimp because it is considered as a high-cholesterol foods. Here we look at important facts about shrimp, how calories in Shrimp and its nutritional. one medium-size of shrimp only contains 7 calories. While the large shrimp which using for cocktail contains 14 calories. Meanwhile, in 100 grams of shrimp that has cooked contains 99 calories. Calories in shrimp is very little when compared to a fried chicken breast that contain up to 181 calories. Besides low-calorie, shrimp is also a useful source of protein for us. Three ounces of grilled shrimp or steamed shrimp contains 20 grams of protein. This amount is almost equal to the amount of protein in 3 ounces of chicken breast. A shrimp could provide 3 grams of protein with little fat and carbohydrates. In addition to containing a lot of protein and fewer calories, shrimp be a source of key nutrients. In 4 ounces of steamed shrimp contains 100% of the daily requirement of selenium, meet 75% for vitamin B12, 50% phosphorus, and contains more than 30% copper, choline, and iodine. So, the shrimp has very remarkable health benefits for humans. Not only that, the shrimp contains two kinds of nutrition is very important, namely mineral that holds for immune function and thyroid function. While the other is selenium. Selenium be high in antioxidants as a destroyer of free radicals. One more very important antioxidant in shrimp is astaxanthin which provides the main color pigment in the bone. These antioxidants are useful to prevent inflammation. 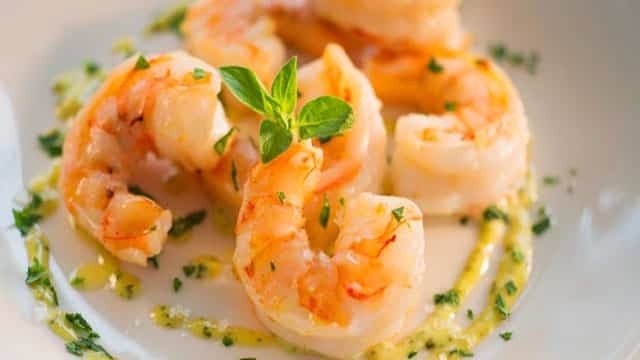 Are shrimps including foods high in cholesterol? USDA and the American Heart Association now make the rule that cholesterol should be limited to 300 mg daily. While 3 ounces already provides about 150 mg of cholesterol. Cholesterol is divided into two. First: Foods Cholesterol, this is the cholesterol found in food. Foods that contain this type of cholesterol only food derived from animals such as shrimp. Second: Blood Cholesterol or serum cholesterol. It is the cholesterol in our body, this cholesterol is produced in liver and then release into the blood. Cholesterol comes from the food that we eat can also contribute to blood cholesterol. However, the cholesterol diet until now been a contentious issue among nutrition experts. Research shows that saturated and trans fats that eaten by humans will give a major influence on blood cholesterol. While the shrimp is the food very low in saturated fat and do not contain trans fats. But the results is different if you cook the shrimp by using oils that contain trans fats. So, the shrimp are healthy foods that do not affect your blood cholesterol because it contains no trans fats, and contains very little saturated fat. However, if you include one of people with high cholesterol, follow your doctor’s advice. The shrimp are still included in the animals in the shellfish’s family. So, the shrimp are top allergens. If you are allergic to shells, then you will also be allergic to shrimp. Other products that are allergens are eggs, milk, fish, peanuts, wheat, nuts and soy. Exposure of shrimp to those who are allergic can give a severe effect. The mildest effects are nasal congestion, itchy skin, sneezing, tingling in the mouth, nausea and abdominal pain. A report in Oceana found that 30% of 143 shrimp is a fraud shrimp products. They sell shrimp ponds as wild shrimp so they get expensive price. Though, it is farmed shrimp that are farmed using antibiotics, fungicides, and other hazardous chemicals. This is a problem that is very unfortunate. We as consumers can not do much and is very difficult to know the product label that has been manipulated. The shrimp is a healthy food, but now many people raising a lot of shrimp by using chemicals that are harmful to consume. The shrimp is the favorite food of Americans, if you are one of them, be careful for chose the shrimp in the market and consumption in reasonable quantities. It would be better if you have your own pond that you breed prawns in a healthy manner. Remember! almost all of the food in the world today are poisonous and dangerous for human health.